Saint Valentine’s romantic act of love was mooshed into Lupercalia, the Roman festival of fertility. And, yada yada yada, today we call it Valentine’s Day. Pitchers and catchers report this week, many on Valentine’s Day. College baseball opens its season this weekend. What a week for love! They even wrote songs about it. 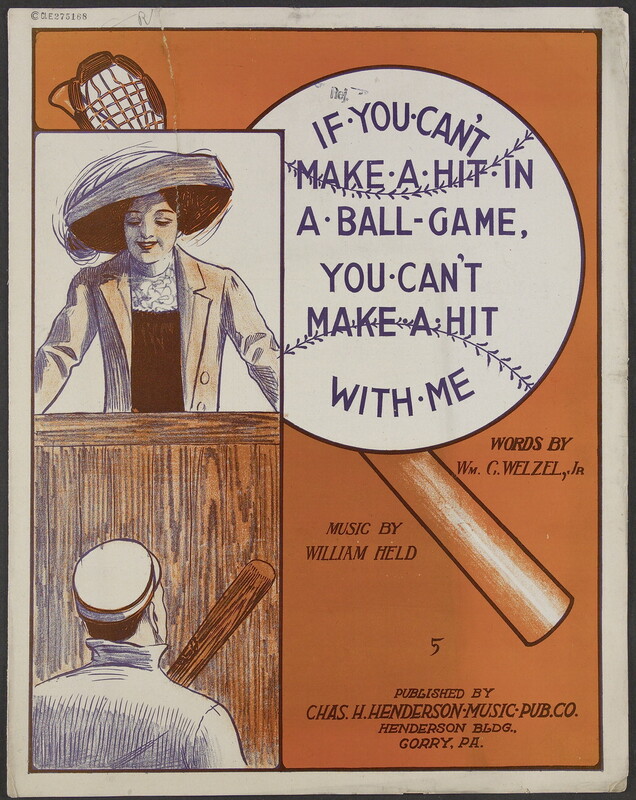 “If You Can’t Make A Hit In A Ball-Game, You Can’t Make A Hit With Me” was a 1912 song – lyrics by William Welzel, music by William Held. Held wrote other music and has his own bio here. But, his ode to a flirty baseball girl with clear standards didn’t even make his bio. A shame. If you can’t make a hit in a ball-game, you can’t make a hit with me. But the man who can hit in a ball-game can be my affinity. I’m simply base-ball wild, Oh! How I yell! Everybody on their feet and making lots of noise. While every eye was staring at that bat of Joe McCoy’s. A crash! Fair ball! A run! The game is won! Women were still fighting to vote in 1912 (don’t blame us for Franklin Pierce), so an empowered woman – even if it was just a flirty girl choosing her baseball boy – was rare indeed. It was the “No Scrubs” of its day. And, Happy Baseball Season! May your team (and by your team, I really mean my team) be filled with strong pitchers (ERA’s round 2.00) and free of air-swingin’ scrubs like Dan Moran. 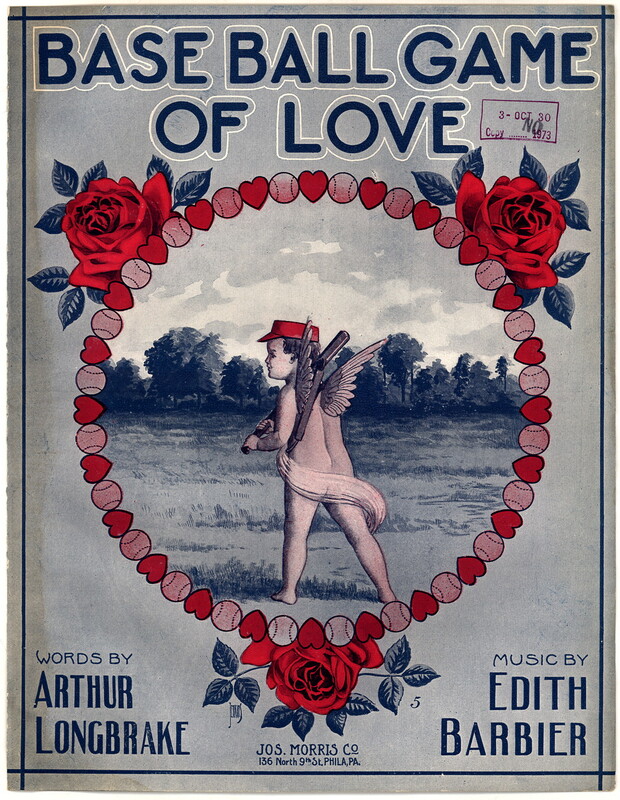 This entry was posted in Baseball, Baseball History and tagged baseball history, baseball songs, Love, Valentines Day by Jackie, The Baseball Bloggess. Bookmark the permalink. Great post! And I did google barney mugging as I had never heard that phrase before, which is always a big thrill for this word nerd. I wish I could tell you how barneymugging came about … I’m just happy to finally have a reason to write “barneymugging” in a sentence AND sneak “No Scrubs” into a post. Win-win! A purely delightful post! I, too, checked out barney mugging for its definition, but there was no explanation of its origin. Happy Valentine’s Day to you and Randy. Barneymugging might have been a throwaway slang term that didn’t last long. But, I’ve done my part to revive it. I’m glad my wife had a different idea. Fun little post. Where did you find the “balk” “sacrifice” etc cards? Never seen them before. Thanks, v. Those postcards were from about 1910 … they turn up pretty frequently on Ebay, etc. There are a bunch of them — more than I had room for in this post. Very odd little cards. I love ’em! Thanks for the info. They’re new to me, but interesting. Happy Baseball Season and Happy Valentine’s Day! This post is all kinds of wonderful. 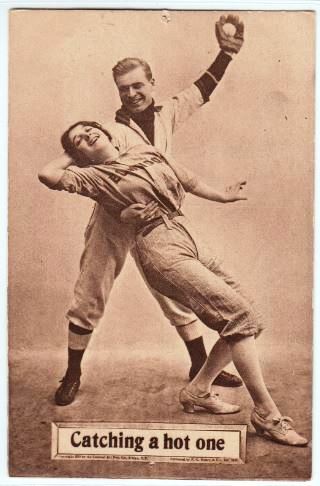 I love the saucy cards (makes me want to run around in a uniform like hers) and ol’ Mary Ann McCann for “whoo”ing and telling it like it is. Thanks, Kate … I’m pretty sure you and I are kindred spirits. 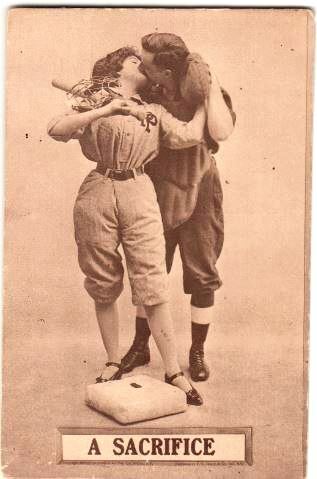 I love those cards, too … and imagining how crazy risqué they must have been in 1910, makes me love them even more. Happy Valentine’s Day and Baseball Season to you, too! What a fun post and those cards! Swoon! Loved them. Thanks for the new word! Don’t know how fast they will become mainstream again…! I know, I love those postcards, too! I just found a couple more from the same era. I’ll have to start poking around in those big boxes of postcards you always find gathering dust at junk stores and see what I can find!